Care2 Causes | Hundreds of Parrots Fly Free! Hundreds of Parrots Fly Free! 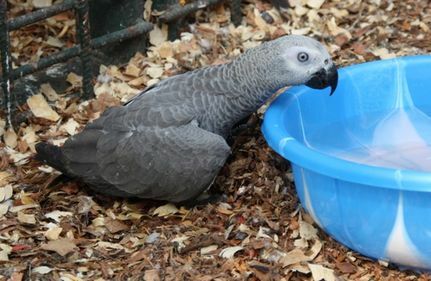 Another consignment of African gray parrots arrived in Limbe Wildlife Centre in December. The parrots were rescued on the way to Nigeria by a joint operation between the Ministry of Forestry and Wildlife (MINFOF) and the LAGA, a non-governmental organization working with MINFOF. The parrots came here in a terrible condition; they were packed very tightly in 11 small crates without food or water. On arrival, 48 birds were already dead. We received about 700 birds. As soon as we received the birds, we released them from the crates and gave them plenty of food and water. They were starving and very thirsty! Our veterinary team brought the birds in the worst condition to our clinic for treatment and intensive care. We left the rest of the birds alone, to avoid stressing them further. Parrots are very sensitive to stress. Many of the parrots are very skinny and have wounds or broken wings after having been packed so tightly in the crates. Even though we have received several parrots like this before, it is always a sad experience each time they come in. The first days, the parrots are very scared. They scream and cry and sudden movements make them frightened. After a few days, it changes. They start singing again! Since the arrivial of the birds, the whole team here has been very busy. Not only does it take a lot of time to feed, water and clean the birds every day, but we have also had to build a new flight cages for the parrots. All of them now have bands on and have been treated for parasites. This week, we have started releasing some of them back into the wild. It is so nice see them fly away into the forest. Hopefully they will never end up in a hunter’s trap again. See more photos of the parrots. Very happy for these Parrots that have been given a 2nd chance at freedom,though saddened for the 48 that didn't make it. With a lot of appreciation and gratitude to those who work around the clock for these birds,THANK YOU!!!! 4 Now Millennials Are Killing the Middle Class!